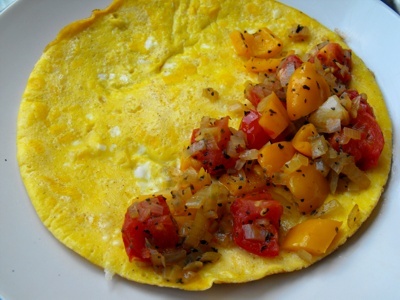 Find out how to make an omelette. 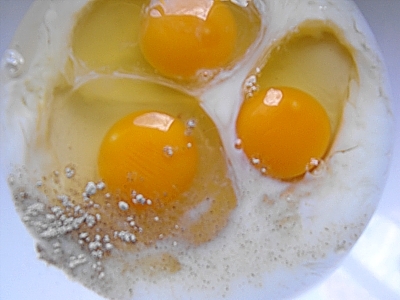 The preparations are similar to making a scrambled egg. I think an omelette sort of resembles a pancake but only made out of egg. 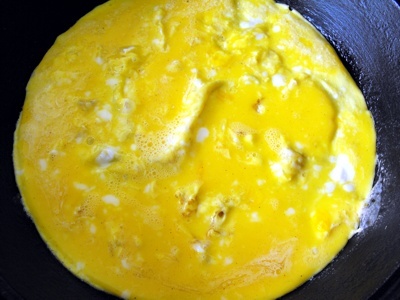 It also resembles a scrambled egg although not scrambled an omelette is left unstirred in the pan to set. 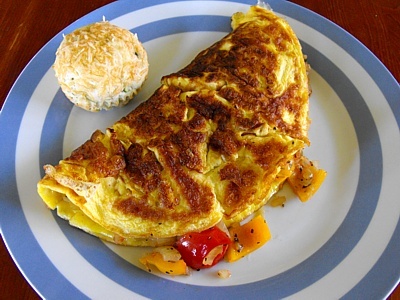 The omelette usually covers the entire base of a round pan. It can be served plain with cheese or filled a with mix of any vegetables accompanied by meat or not. There are many different ways to cook an omelette but this is how we do it. In our example we chose a filling of seasoned onion, tomato and capsicum. The filling possibilities are endless and depend very much on season and taste. The amounts given are for one portion (one omelette), for more than one omelette just multiply to fit the portions that you want. After one omelette is finished place it in a warm place until the others are done like in the oven on low heat... Or you can be tricky and make the omelettes all at the same time in different pans if you are a professional multi-tasker. Peel and dice the onion and the garlic. Then wash and cube the tomato and lastly wash, decore and dice the capsicum (bell pepper). The colour of the capsicum does not really matter. The yellow just went well the red of the tomato. It depends more on your preference. The green ones are not as sweet, the orange ones in my opinion have the least flavour the yellow ones are nice but the red capsicums are my personal favourite. Leave all ingredients prepared on your cutting board. Grate some cheese and set aside. Heat the olive oil in a pan and sauté onions until they are translucent. Then add one teaspoon of dried basil (if you want to use fresh basil add it in right at the end when all of the ingredients are ready to be added to the omelette) and pepper and salt to taste. 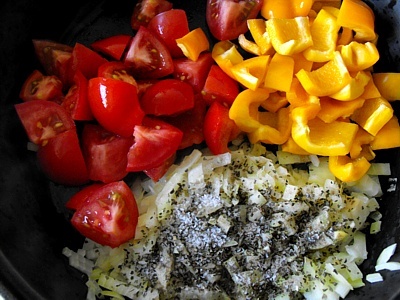 Now follow with the tomato cubes, the diced capsicum and some sweet paprika. Simmer at lowest heat for five minutes. In the second pan heat the olive oil. Make sure that the whole frying surface has a thin film of oil. You can test if the oil is hot enough by dripping in a drop of water, if the water dances on the surface then it is hot enough. Until then whisk the eggs, milk, pepper and salt with a fork the top of the mixture has bubbles covering it. The more you whisk the fluffier the omelette will become in the frying process. 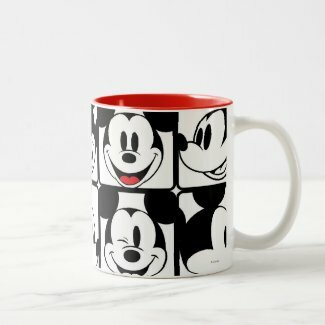 Pour the mixture into the hot pan. Turn the heat to the lowest temperature, prick the omelette with a fork when air cushions come up from underneath. Put a lid on the pan and let the omelette set. When it is done and no runny patches are visible any more sprinkle some cheese on top. When the cheese has melted take the omelette out of the pan and spread the filling over half of the omelette and flip the plain half on top of the filling. Skip to .... to leave your thoughts about how to make an omelette.